​​​​​​​HONOLULU – Career educator Chad Keone Farias will take the helm of complex area superintendent for the Ka‘u-Keaau-Pahoa (KKP) complex on Hawaii Island, succeeding Mary Correa, who mentored him for the position and will be retiring on December 31. 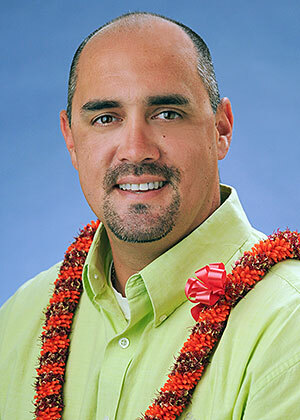 ​Farias, 43, has spent his entire career on Hawaii Island, most recently as Keaau Elementary principal since 2008. Under his leadership, Keaau Elementary was one of the pioneers in digital learning among its staff and students, boosting student achievement and lowering chronic absenteeism. Farias previously served as vice principal at Keonepoko Elementary and his alma mater, Hilo High, where he held his first teaching job. The Hawaii State Board of Education appointed Farias to the Complex Area post on September 16 to be effective on January 1. Correa retires with more than 40 years in the Hawaii State Department of Education (DOE) – the last decade as the KKP complex area superintendent. She also served as an administrator at Hookena Elementary, Hilo Community School for Adults, Pahoa High and Intermediate and Hilo Intermediate schools. Early in her career, Correa taught at Waiakeawaena Elementary, Laupahoehoe Elementary, Waimea Elementary and Intermediate, and Saint Joseph Elementary and Intermediate. Correa is best known for her phrase, “If can, can…if no can, how can,” which challenged educators to overcome severe socioeconomic barriers and raise student achievement among what had been historically known as Hawaii’s lowest performing schools. The KKP complex schools have since emerged as a successful improvement model for the state after receiving targeted supports as “Zones of School Innovation” in the DOE’s Race to the Top (RTTT) federal grant. The KKP complex has close to 5,500 students in nine schools spread across the largest geographic region of any complex area in the state. Correa’s exceptional leadership has been vital in the last four months in weathering two hurricane threats that closed schools, and the Puna lava flow, which forced the closure of Keonepoko Elementary indefinitely. She led her KKP team in ensuring a seamless education transition for 1,700 students and 300 staff to relocate to other schools within the complex.